Another Look at Submission Grappling: UFC on Fox Velasquez vs Dos Santos | MMA Fighting Events Videos Techniques UFC Fight Picks and News. 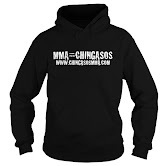 Without a doubt, throwing chingasos in today's mma is extremely important, as Demarques Johnson proved on Saturday. But, being able to throw blows or even just wrestle isn't enough. Having a great submission game is absolutely necessary if you want to be the head honcho, la creme de la creme, el mero mero, el mas chingon. Even GSP, who is now a dominant wrestler, knew that he had to improve his submission game. When GSP faced off against Matt Hughes, he came out with his first career loss. GSP went for a kimura without locking down Hughes. Hughes used that mistake to spin around and armbar GSP. After that fight, GSP continued to work on his submission game. In fact, when Hughes and GSP met for the rubber match, GSP's submission game had improved so much that he was the one to finish the fight with an armbar. At UFC on Fox - Velasquez v Dos Santos, you saw the submission game take center stage at many of the fights. For example, in the Swanson vs Lamas fight, you saw Lamas pull off a head and arm choke against Swanson. Even before that, Lamas had to use his submission skills to survive a deep guillotine attempt by Swanson. In the Yamamoto vs Uyenoyama fight, Uyenoyama had such confidence in his submission grappling that he didn't mind being at the bottom. In one particular exchange, Uyenoyama was thrown to the ground but used his ground skills to recover from side control immediately. In the second round, Uyenoyama took a vicious chingaso that cut him, but he used his grappling to survive without panicking. Although he did not finish the fight with a submission, Uyenoyama controlled the fight on the ground using his submission skills. In the second round of the Poirier vs Garza fight, Garza used his knee to block Poirier from advancing and from landing chingasos in the form of ground and pound. Garza used a basic move from the bottom. He got an undertook and attempted to use it to get back to his feet. Poirier's submission grappling was on point and he recognized what Garza was doing instantaneously. 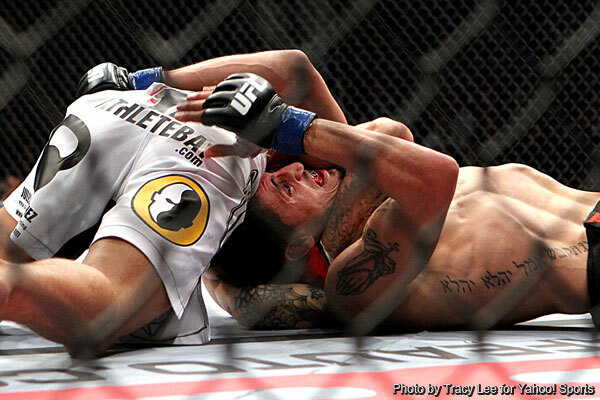 Poirier immediately sunk in a D'arce choke (also known as a brabo choke) to finish the fight. However, for me, the most impressive fighter of the night was Alex Caceres. He did not finish the fight and went all three rounds against Cole Escovedo. Escovedo was supposed to be the better grappler while Caceres was considered the striker. Caceres was only supposed to be a flashy, wild chingaso thrower. When the fight hit the ground, Escovedo went for a submission a few times. However, Caceres quickly escaped each time. Not only was Caceres able to quickly escape submission attempts, he came the closets to finishing the fight with his own submission attempt. I was impressed with Caceres, not because he came close to finishing the fight with a submission, but because he showed a great deal of improvement in his mma game. At times he was flashy with his striking, but he was always under control. More importantly, he showed maturity and improvement by not sticking to what he knows best. It was obvious that Caceres went into the gym and worked hard on his submission skills. Yes, striking and wrestling are important in mma. But, the one area that is absolutely necessary is submission grappling. Caceres was obviously not content with just being a striker. Caceres improved his overall mma game by bringing up his submission grappling game. Caceres definitely doesn't have an 8-track mma game.